VNRE – By the end of October, the Chan May-Lang Co economic zone (Thua Thien-Hue) has attracted 35 investment projects with total registered capital of more than 32,000 billion VND, equivalent to over two billion dollars. Among projects, there are 11 FDI projects with total investment of nearly U.S $1.4, 24 domestic projects with total registered capital of 10,395 billion VND. Thua Thien-Hue province has created favorable conditions to expand Chan May oil storage (from 7.000m3 up 100.000m3) and built oil port 30,000 DWT of PV Oil Corporation. Thua Thien-Hue also accelerate the already licensed projects, especially the Laguna Hue Resort; technical infrastructure of Saigon-Chan May industrial and non-tariff area, Chan May Hospital. A number of other projects such as Banana Beach resort, the Thu Duc-Lang Co office-hotel complex will continue to be deployed. Laguna Hue project by Banyan Tree Group (Singapore) as an investor on an area of 280ha with a total investment of U.S $875 million. Expected, the building will be developed in four phases. When completed, there will be seven luxury hotel zones with 2,000 rooms, more than 1,000 apartments, spas, shopping, international conference center, golf courses, entertainment venues, and many works to development tourism. The first phase of the project include two resorts, an 18 hole golf course and apartments for sale, expected to be completed in late 2011. Thua Thien-Hue province is speeding up the completion of technical infrastructure and essential social of Lap An, Vinh Loc, Loc Tien resettlement with a total area of about 90ha, the ability to re- for 2,000 households in the area of compensation and land acquisition. On that basis, Thua Thien-Hue ensures to has about 1,000 ha cleaning space for needs of investment and development in Chan May economic zones. In 2011, the Management Board of Chan May-Lang Co will strive to bring the total investment implemented in the economic zones is about 3500-4000 billion, attracting new investment capital of 5,000 billion; completed the first phase of infrastructure of Saigon-Chan May industrial, non-tariff areas, promote investment to attract investment projects in industrial zones. Management Board of Chan May-Lang Co to complete the construction of important roads as the way to the Chan May port and Chan May urban center roads; plan project call for ODA projects, government bonds for a number of infrastructure projects in key economic zones. VNRE – The inauguration ceremony of the Resettlement Area Infrastructure and the ground-breaking ceremony of Saigon Golf, Country Club and Residences (SGCCR) was held at the construction site – An Phu Ward, District 2, Ho Chi Minh City – on October 23rd, 2010. SGCCR will be the first development in Vietnam to offer a unique and luxurious combination of golf, resort lifestyle and family entertainment in one location just minutes from the city center. The developer, Saigon Development and Investment Corporation (SDI) was proud to announce the completion of the resettlement area infrastructure for affected families. 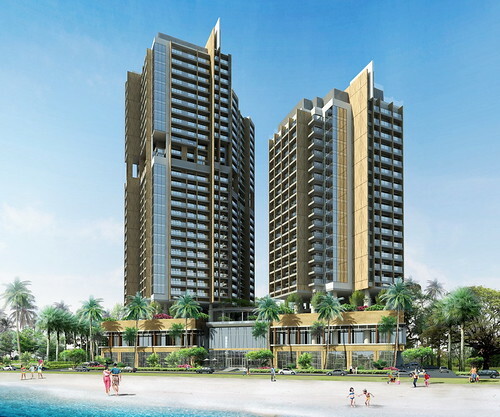 The infrastructure has been completed prior to the construction of the Saigon Golf, Country Club and Residences. To highlight their contribution to the community, SDI donated one billion VND to the Youth Talent Fund of District 2. The legendary golfer Greg Norman along with SDI board members, government officials, and honorary guests broke the ground for the complex. Greg Norman is the designer of the Saigon Golf Course and the principal behind the Reflection by Greg Norman. Additionally, he discussed his involvement in the project with press, invited guests and dignitaries. SGCCR has a total area of 120 hectares developed by SDI Corporation. The SGCCR project features an 18-hole championship golf course, 193 villa residences based in three locations around the site and 132 condominiums housed in two separate blocks inclusive of 8 magnificent penthouses, together with a country club, a City Spa designed and managed by Six Senses Spa, and a hotel/serviced apartments complex. Saigon Golf, Country Club and Residences is designed and engineered by an international consultancy team including Greg Norman Golf Course Design, Southern Cross Development, renowned architects Alex Popov & Associates, DWP, and CPG. The Project Management and Sales & Marketing team is Norfolk Group. The construction of the golf course is being undertaken by Linksshape with Sala Design Group providing the landscape concepts and designs. The golf course and residences are scheduled for completion by end of 2012 and 2013 respectively. Saigon Development and Investment Corporation (SDI) is the owner of Saigon Golf, Country Club and Residences. Formed in 1999, SDI is a group of leading international and local business people whose philosophy is to bring together the very best minds in development to carefully select projects that offer a unique investment opportunity to its clientele, while setting new standards that will rival the finest developments in the world. Started his professional golf career in 1976. The world’s number one ranked golfer for 331 weeks in the 1980s and 1990s. Coming up project: Lorena Ochoa (former number 1 player in the world from 2007-2010) and Greg Norman (winner of 91 tournaments worldwide and the number 1 player in the world for 331 weeks) announced a partnership to jointly design championship and resort golf courses worldwide. To start this historic partnership, the two golf superstars have contacted the International Olympic Committee (IOC) in hopes of being selected to co-design the golf course that will host the 2016 Olympic Games in Brazil. He is internationally renowned golf course designer, the founder and operator of Southern Cross Developments. Southern Cross Developments International (Southern Cross) is a real estate development and investment company specializing in the brand and lifestyle positioning and capital structuring to differentiate and enhance real estate. Founded by Greg Norman, Jeremy Seabridge and Brett Walsh. Southern Cross’ projects are located in highly desirable lifestyle environments such as golf course communities, marinas, skiing destinations, seaside resorts and environmental/ecotourism developments as well as high-end urban residences. 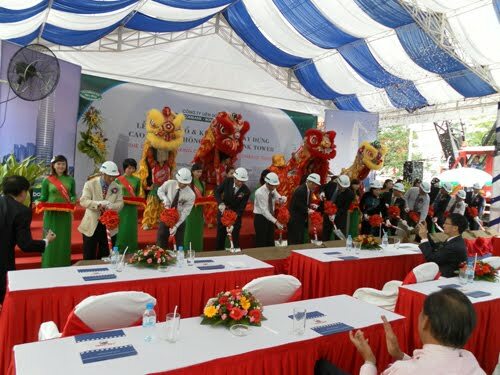 VNRE – On 28/10, Vietcombank – Bonday – Benthanh Joint Venture Company Limited (VBB) officially started the Vietcombank Tower office building project in Me Linh Square, District 1, HCMC. The project is built on an area of approximately 3,200 square meters, consists of 35 floors and a total investment of approximately U.S. $96.5 million, of which the construction cost accounts for about U.S $69 million. VBB said, when completed the Vietcombank Tower will provide about 55,000 square meters of Grade A office, and will simultaneously placed the headquarters for the Bank for Foreign Trade of Vietnam – Ho Chi Minh City branch. As expected, Vietcombank Tower building will be completed and put into operation in July/2013. VNRE – The central coast city of Danang is witnessing more tourism property projects emerge into reality as several resorts reach completion or final stage of construction. Among the projects, Fusion Maia Danang, developed by local company 559 Investment JSC, has been put into service after three years of construction. The luxury resort on Son Tra – Dien Ngoc Street in Ngu Hanh Son District, has 87 villas and individual houses designed with private swimming pools and other serviced facilities including spas. In addition to three restaurants, the resort has a small ballroom that can accommodate 100 people. The developer says the facility is designed to target high-end customers, with room rates at US$260 (VND5.1 million), inclusive of services such as transport and spa. In another development, Vinpearl Danang JSC is pressing ahead to open its tourism property project in Danang City after nearly a year of construction. The company had invested US$100 million in its Vinpearl Danang Luxury Resort & Residences project, which covers 15 hectares on Son Tra – Dien Ngoc beach. 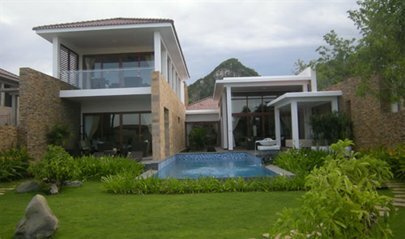 The on-going project is designed for a five-star hotel with 209 guest rooms and a 39 luxury villa section named Vinpearl Danang Luxury Villas with average selling prices of US$2 million per unit. To promote sales, the developer is wooing villa buyers by assuring a 10% profit annually over the price of a villa in the first three years through the project’s rental program. Tran Van Tang, general director of Vinpearl Danang JSC, says the program is designed to share profits with individual investors, making them feel safe in their investments, as well as showing investors confidence in the project’s potentials. The developer says the project has finished basic construction. As scheduled, the hotel section will be up and running by May next year and the villa section will be finished and handed over to buyers by late next year. VNRE – Vincom Joint Stock Company has announced to move the headquarters of its securities arm in Hanoi to HCMC so as to focus resources on its core real estate business operations. Vincom Securities Co., a Hanoi Stock Exchange member that has total chartered capital of VND300 billion and manages over 18,000 trading accounts, will open its HCMC headquarters in the next two weeks. In a statement on the forthcoming closing of the Vincom Securities head office, parent firm Vincom does not mention the exact location but on its website, it says the 25-storey Vincom Financial Tower on HCMC’s Nguyen Cong Tru Street already lined with stock brokerages and banks will become a leading stock trading floor in Vietnam. The tower, just a walking distance from the Hochiminh Stock Exchange, nears completion. Le Khac Hiep, chairman of Vincom, said in the statement that the company had long considered scaling down its financial investment operations given the market reality. “One thing that led us to make the decision fast is the ineffective and inefficient performance of our securities firm. It has already failed to meet its yearly targets,” Hiep said and added Vincom intended to sell its entire stake in the securities company in the future. Vincom now owns 75% of the stock brokerage. Hiep said the transfer of the stake in Vincom Securities would be done step by step to avoid causing any inconvenience for customers. Details about the stake transfer will be announced after December 10 when the company turns three and its founders have the right to sell their stakes, says the statement. Customers of Vincom Securities will have three options. First, they can stay but must trade shares at the company’s HCMC premises or on the Internet; second, they can choose to close their accounts at the company; third, they can move their accounts to VPBank with all customers’ rights guaranteed. VNRE – The Costa Nha Trang is built on an area of 12,042 m2, located at 32-34 Tran Phu – the golden street of Nha Trang City, Khanh Hoa Province. The Costa Nha Trang is a combination of 20-storey hotel and 29-storey apartment building. This is the first 5-star complex hotel-apartments on the beach in Nha Trang. The project includes hotel with 308 rooms and 244 apartments were designed in contemporary architecture inspired by beauty natural as well as Asian culture, especially the beauty of Nha Trang and the Cham culture. The Costa Nha Trang will offer residents the convenience and high service standards 5 stars as modern swimming pool, gym, relax in the spa, gather friends or enjoy dinner with family at the restaurant of the hotel. The total investment is about $147 million, TD Corporation as investor, Savills Vietnam is the Exclusive Sales & Marketing Agent. Crowne Plaza Nha Trang hotel wil be managed by the InterContinental Hotels Group (IHG) and Cushman & Wakefield (United States). According to the plan, The Costa Nha Trang will be completed in 2012. VNRE – CapitaLand, through its wholly-owned subsidiary, CVH Cayman 10 Limited, held through another wholly-owned subsidiary, CapitaLand (Vietnam) Holdings, has signed a Conditional Joint Venture Agreement (“JVA”) with No Va Land Investment Group Corporation (“NovaLand”), a leading real estate developer in Vietnam, to jointly develop a residential site in District 9, Ho Chi Minh City, Vietnam. The signing ceremony held in Hanoi today was witnessed by Singapore Prime Minister Lee Hsien Loong and Vietnam Prime Minister Nguyen Tan Dung. The approximately 9,000-square-metre site is located in Phuoc Long B Ward in Ho Chi Minh City’s District 9, an established populous area with amenities such as a supermarket, vocational school and planned sports and recreational facilities. CapitaLand and NovaLand plan to develop the site, located about 10 kilometres from the city’s Central Business District, into a residential development with approximately 500 apartments. remaining 30% stake from the injection of the site into the joint venture. The site is strategically located at Do Xuan Hop Street, Phuoc Long B Ward in District 9, at the fringe of the city centre in Ho Chi Minh City. 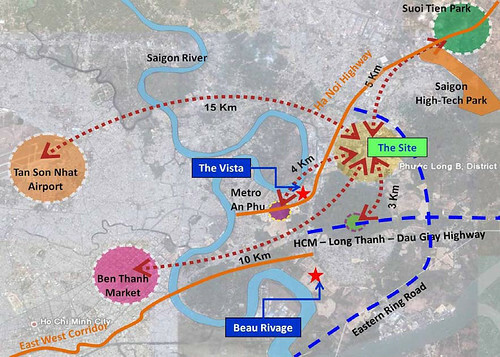 The development sits close to the future Ho Chi Minh – Long Thanh Highway and Hanoi Highway. It is within close proximity to the proposed Saigon Sport City & Saigon Golf Mixed-use Development projects, as well as Ho Chi Minh Vocational College of Technology and Saigon Hightech Park. The above transaction is not expected to have any material impact on the net tangible assets or earnings per share of CapitaLand Group for the financial year ending 31 December 2010. None of the Directors or the controlling shareholder of Capitaland has any interest, direct or indirect, in the above transaction. Vietnam is a key market in Asia for CapitaLand Group. Vietnam is the Group’s fourth pillar of growth, in addition to its core markets of China, Singapore and Australia. The real estate market is supported by the country’s strong economic growth, stable government, coupled with rapid urbanisation and a young and growing population. CapitaLand is committed to being a long-term real estate player in Vietnam. Currently, the Group’s presence in Vietnam is in Ho Chi Minh City, Hanoi, Hai Phong and Danang, in the residential and serviced residence sectors. The Group has five quality residential projects with a development pipeline of over 4,500 residential apartments in Ho Chi Minh City and Hanoi. Its wholly-owned serviced residence business unit, The Ascott Limited, has over 1,300 apartment units in eight properties across the four major cities, making it the largest international serviced residence owner-operator in Vietnam. Nova Land Investment Group Corporation (“NovaLand”), formerly known as “Thanh Nhon Trading Ltd.” established in 1992 and merged in 2004, is the real estate investment and development arm fully owned by Nova Investment Group. 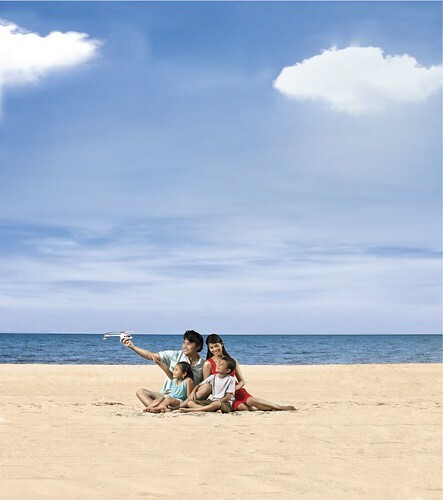 NovaLand is one of the most prominent real estate development groups of international stature in Vietnam. NovaLand is helmed by a professional team and focuses on large scale and premium projects in good locations. Fanning out of Ho Chi Minh City, NovaLand has development interests in urban areas, resorts, residential, offices and commercial projects. NovaLand’s flagship project is Sunrise City, a premium 500,000 square-meter mega-mixed development situated in District 7 of Ho Chi Minh City with an investment capital exceeding US$500 million. The member companies of NovaLand include The Novaland Company, Thanh Nhon Real Estate Company, Novaland Thao Dien Company, Novaland Vidiphar Company, Novaland My Dinh Company, Novaland Long Thanh Company, Novaland Phuc Long Company, Dong Tay Real Estate Company and Novahomes Company. 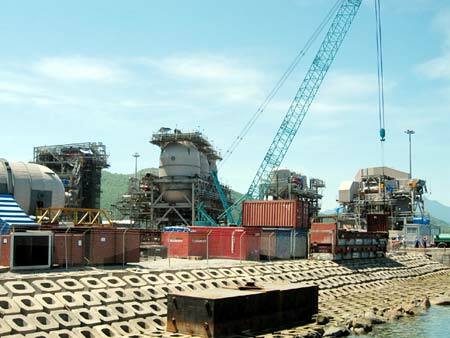 NovaLand has a robust chartered capital of VND 1,200 billion and is slated for listing on the stock exchange in 2011. The company’s real estate and hospitality portfolio, which includes homes, offices, shopping malls, serviced residences and mixed developments，spans more than 110 cities in over 20 countries. CapitaLand also leverages on its significant asset base, real estate domain knowledge, financial skills and extensive market network to develop real estate financial products and services in Singapore and the region.